How Important is a Beautiful Smile ? A Beautiful Smile is Empowering...Health is Reassuring...Together they are Unstoppable! If you are blessed with beautiful, natural teeth that are perfectly positioned, you may only need routine care: cleaning and polishing to radiate your wonderful smile. Specific home care instructions will help you keep it that way for a lifetime of smiles. Teeth Whitening: If your teeth are healthy but discolored, a unique customized tooth whitening process can easily and comfortably brighten you smile, making it more youthful and attractive. Tooth whitening is a fast and cost effective way to a WOW smile. Aesthetic Tooth Re-contouring: Reshaping the periphery of a tooth can be a simple and fast solution to an imperfect smile and, on occasion, may be all that is needed to create balance and harmony in a smile. Smoothing an irregular or rough edge or straightening and reshaping contours with minimal composite bonding may be all that stands between you and your ideal smile. 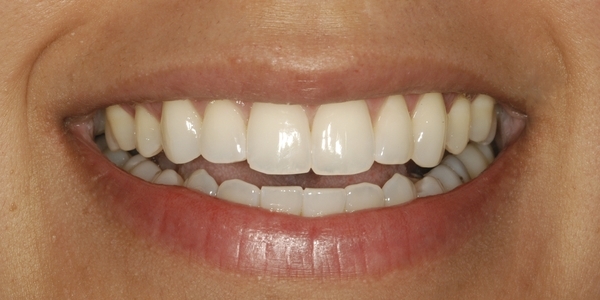 Porcelain Veneers, Crowns, Inlays, Onlays: More advanced cosmetic dentistry can realign slightly out-of-position, discolored or heavily treated teeth by placing porcelain veneers or crowns over the teeth in a smile makeover to recreate a balanced, straight smile that is both beautiful and healthy. This is the most common solution to rebuilding a beautiful smile. Implants: if you are missing one or more teeth, implants offer excellent solutions. They are the most important and most beneficial advancement in dental care for patients since the early 1980s. They are now an essential ingredient in cosmetic dentistry as well as all other fields of dentistry. Orthodontics: Teeth can also be realigned without veneers or crowns through orthodontics, which applies porcelain brackets and wires and moving them into balanced position or uses clear positioning trays to guide the teeth into proper positions. Two such systems are called Invisalign and Clear Correct. Moving teeth prior to placing all-ceramic restorations can create the most ideal aesthetic results. Orthognathics: This is an advanced dental surgical treatment and is occasionally used to create a balanced, properly functioning mouth. Orthognathic dentistry is used when the bones of the mouth are too far out of position to allow for proper redesigning of a smile by any of the preceding techniques, and they need to be repositioned to maximize proper function and aesthetics. After repositioning, standard cosmetic dental procedures can be successfully performed with excellent results. Full Mouth Reconstructive (rehabilitative) (FMR) dentistry: FMR is used when the entire mouth has deteriorated to the point that the chewing surfaces must be rebuilt, realigned and the remainder of the mouth is broken, stained, out of place and totally unattractive and non-functional and is in need of an esthetic makeover. FMR involves any/all technical aspects of dental care. Rebuilding the occlusal (chewing) surfaces of molar teeth is very important in cases badly worn mouths. If esthetic dentistry is attempted without proper support from the molars, it will fail. This may involve just one or more or all the back teeth. Each case is different. 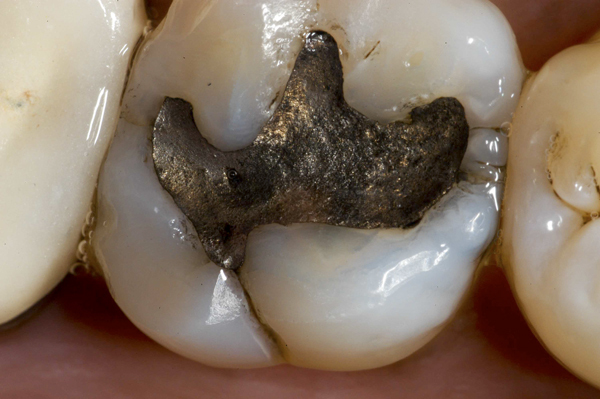 Amalgam fillings have been used in dentistry for over half a century. They are durable and have served countless patients well for that reason. But amalgam fillings present very serious problems for patients. They possess mercury and some people present sensitivities to the components of an amalgam restoration. There are definite concerns to be addressed on that topic. However, the damage they create within the mouth is more widespread and destructive to your teeth. Amalgam fillings do not bond the remaining parts of the tooth together. They actually expand (creep) over time adding internal stress to a strong but brittle crystalline enamel tooth structure and can allow a tooth to develop fractures. 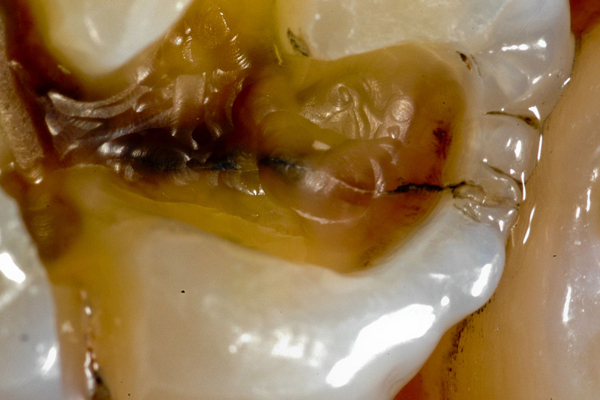 The following pictures are examples of a dangerous split in the middle of a tooth (Figs. 1, 2 below). This occurs most often in molar teeth because we apply the greatest grinding pressures to them, flexing them in the process. When bonding first appeared in the 1980s there were days for Dr. Prus that were totally filled with repairing broken teeth due to amalgam fillings. Fractures of teeth due to the presence of amalgam fillings can be minor, as when a piece of tooth breaks away; they can also be fatal to the tooth, as when they split the tooth in the middle. These splits are frequently the reason you feel pain when chewing strongly on something and get a sharp, needle like pain in a tooth. That is an indication that the tooth fracture has grown. Strangely, it is the medium sized amalgam fillings that create the most damaging consequences-spitting a tooth down the middle. Many times this necessitates root canal therapy, or worse, the tooth has to be extracted. Tooth fracture is the most frequent reason Dr. Prus has to replace silver fillings with crowns. It is for this reason Dr. Prus does not place amalgam fillings. Molars are the most important teeth in the mouth in determining how well the mouth functions and endures for a lifetime. They act like the foundation of a house holding everything in place. If you weaken a house foundation the entire structure suffers. It is the same with the molars in your mouth. As we live longer and longer we are finding that molars do not last our lifetime--they wear out, just like anything else that is aggressively used every day. As such they must be protected with the longest lasting restorative materials when they need to be restored. The exact therapy is determined by the severity of the split. All completed restorative and prosthetic dental work is by Dr. Prus unless noted.